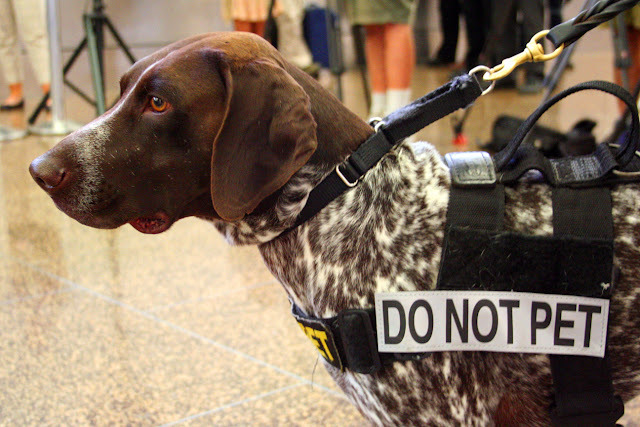 With the summer travel season in full swing, the Transportation Security Administration (TSA) and many local police departments are using explosive-sniffing dogs to help patrol U.S. airports. So far this summer, TSA has screened an average of 2.3 million passengers per day at 440 airports nationwide. That means a lot of passengers, lots of luggage and, at airports including Seattle-Tacoma International (SEA), a lot of sniffing. Recently, TSA and the Port of Seattle Police Department held a “meet-and-greet” with a half-dozen of the two departments’ furry finest. Despite their “Do Not Pet” vests, there was a fair bit petting involved – with the handlers’ consent – before the dogs were put through their paces. The dogs are specially trained to detect explosives and components of explosives, and will alert when they find anything suspicious. When on duty, the dogs are simultaneously searching and training. She would not discuss real incidents “for a variety of reasons,” but said that both agencies use training aids to ensure that the dogs experience success daily, keeping them in practice and motivated. The dogs are tethered to their handlers and work in close proximity to passengers. Their handlers are trained to read their dog’s behavior when it indicates an explosive scent has been detected, even without the source being aware and even if the source is mobile, the two agencies noted. That ability to follow suspicious odors to pinpoint exact locations give the dogs an edge over currently available mechanical detection devices. At SEA, the dogs not only patrol the lines waiting at the security checkpoints, they patrol the main lobby and ticketing area, sniffing baggage before it is checked in. Should a dog identify a genuine threat, they are called off and rewarded while their handler radios a description of the suspect to other officers in the area. Because they are trained for detection, the dogs do not take part in detaining any suspects. 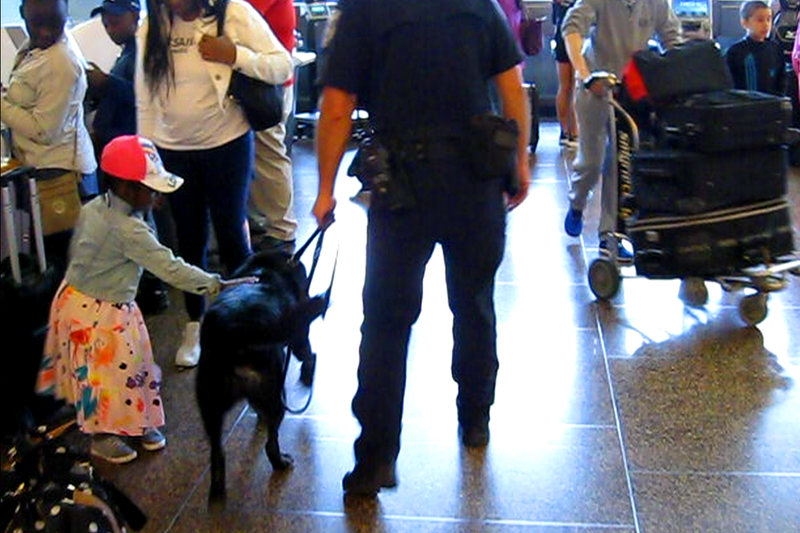 The video shows Port of Seattle K-9s Milo, an English Lab, and Ty, a Black Lab, successfully identifying training scents placed in luggage carried by Port employees mingling with airport passengers. Both departments use floppy-eared dogs, including German Shorthaired Pointers and English Labradors, in part because their appearance is less intimidating than pointy-eared dogs such as German Shepherds or Belgian Malinois, which are often used in police work. TSA and Port of Seattle explosive detection K-9 teams have been through 12 weeks of intensive training at Lackland Air Force Base in San Antonio. Teams are tested regularly and must maintain certification. So next time you travel, rest assured that the furry, four-legged thing sniffing around your luggage isn’t interested in the smoked salmon you’re taking to your relatives. He or she has bigger fish to fry.